'Forward, March! ': Listen to O..
MTSU Out of the Blue: November..
Tennessee is in the spotlight in November as MTSU hails three important historic anniversaries. Six celebrations are scheduled around the state to mark the 20th anniversary of the Tennessee Civil War National Heritage Area, the 50th anniversary of the National Historic Preservation Act and the 100th anniversary of the National Park Service. Tennessee Commissioner of Tourist Development Kevin Triplett will be the honored guest at the Wednesday, Nov. 9, event from 5:30 to 7 p.m. at the Heritage Center of Murfreesboro, located at 225 W. College St.
Thursday, Nov. 10 — Glen Leven Farm, 4000 Franklin Pike, Nashville, 12:30 to 2 p.m.
Friday, Nov. 11 — Hiwassee River Heritage Center, 8746 Hiwassee St., Charleston, Tennessee, 12:30 to 2 p.m.
Monday, Nov. 14 — East Tennessee Historical Society, 601 S. Gay St., Knoxville, Tennessee, 12:30 to 2 p.m.
Friday, Nov. 18 — Parker’s Crossroads Visitor Center, 20945 Hwy. 22 N., Parker’s Crossroads, Tennessee, 12:30 to 2 p.m.
“Our goal is to meet and personally thank as many Tennesseans as possible because it is their commitment, energy and excitement that have allowed our National Heritage Area to flourish and to serve all 95 counties of the state,” said Dr. Carroll Van West, Tennessee State Historian and director of MTSU’s Center for Historic Preservation. 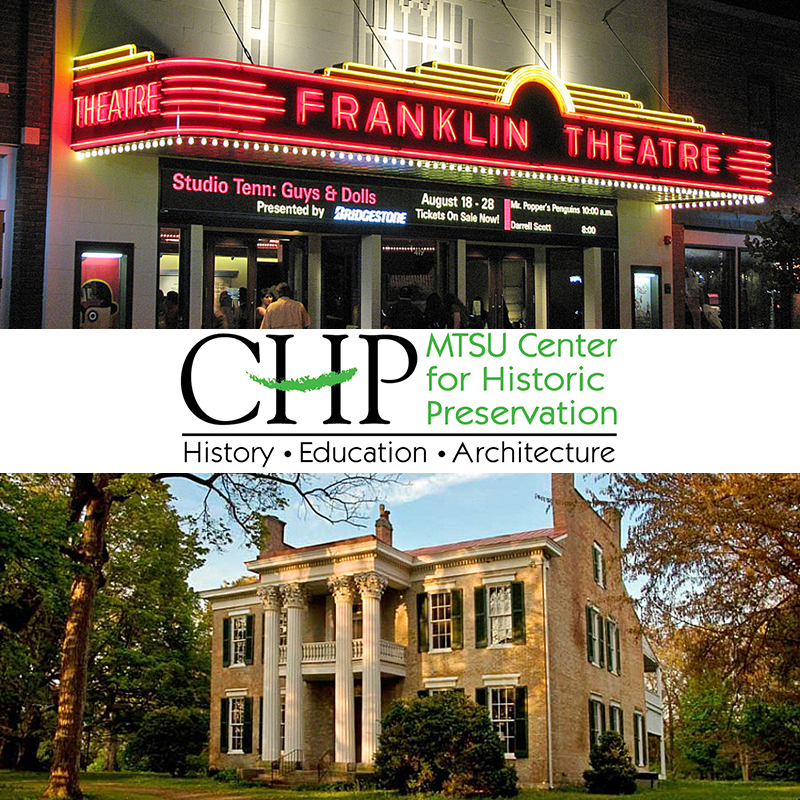 The CHP has worked since 1984 with the Tennessee Historical Commission to bring benefits from the federal preservation program to Tennessee property owners and communities. The National Historic Preservation Act, which Congress approved in 1966, has expanded American preservation to communities across the country through programs like the National Register of Historic Places. The register is administered by the National Park Service, which was created in 1916 to preserve the natural and cultural resources of specific areas of the country. The historic celebrations are sponsored by the MTSU Center for Historic Preservation, the Tennessee Civil War National Heritage Area and the Tennessee Department of Tourist Development. All events are free and open to the public, but advance notice is appreciated. Light refreshments will be served. For more information, visit www.mtsuhistpres.org, call 615-898-2947 or send an email to alexandria.mcmahan@mtsu.edu.